FILE - Homeland Security Secretary Kirstjen Nielsen testifies on Capitol Hill in Washington, March 6, 2019, before the House Homeland Security Committee. Director of the United States Secret Service Randolph Alles speaks at the Atlanta Press Club in Atlanta, Feb. 1, 2018. 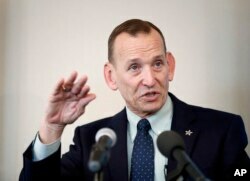 On Monday, the White House said the head of the U.S. Secret Service (USSS) Randolph "Tex" Alles would step down. Three days earlier, President Donald Trump rescinded his own nomination for the director of U.S. Immigration and Customs Enforcement (ICE) Ronald Vitiello. The top-down shake-up is said to be motivated by Trump's interest in more restrictions regarding migration at the U.S.-Mexico border, and with immigration overall. In rescinding Vitiello's appointment last week, Trump said, “We want to go in a tougher direction" on immigration but did not elaborate. “Secretary Nielsen’s had a rocky tenure... from denying family separations were initially happening to having to justify the 'zero-tolerance' policy," said Krish O'Mara Vignarajah, president of Lutheran Immigration and Refugee Services. "This wasn’t altogether unexpected." But migration is not triggered by one variable, such as congressional action, rather by several: conditions in migrants' home countries, policies in the United States, economic variables, weather. And that list changes. 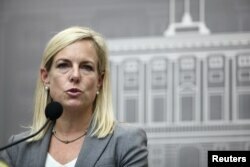 Neither Nielsen nor Trump, however, have publicly acknowledged that the administration's policies may in fact be contributing to the increased number of border-crossers in recent months, as Dree K. Collopy, chair of the National Asylum and Refugee Liaison Committee of the American Immigration Lawyers Association, suggested in January. "It is deeply alarming that the Trump administration official who put children in cages is reportedly resigning because she is not extreme enough for the White House’s liking," House Speaker Nancy Pelosi said in a statement following Nielsen’s announcement. Castro went on to say McAleenan "cannot be trusted... based on his record of prioritizing Trump's harmful policies." But Nielsen's removal and McAleenan's temporary appointment are not a slam dunk on either side of the political spectrum. Noted immigration restrictionist Mark Krikorian, head of the Center for Immigration Studies, tweeted that he is "not sure McAleenan would be an improvement over Nielsen." He fully opposed Cissna's possible removal and said it would be a "colossal blunder." FILE - Homeland Security Secretary Kirstjen Nielsen addresses the media, after Hurricane Maria's devastation, in San Juan, Puerto Rico, Dec. 19, 2017. O'Mara Vignarajah, head of LIRS, said that may reinforce Trump’s interest in clamping down on asylum-seekers. “We cannot effectively employ a law enforcement answer to what is a humanitarian problem," O'Mara Vignarajah said. "We just hope that Nielsen’s departure doesn’t allow for new leadership to be put in place doubling down on policies to turn away vulnerable women and children."